A clinical research is a study with the goal of answering specific questions about new therapies, vaccines or diagnostic procedures, or new ways of using known treatments. Clinical research (also called medical research and research studies), are used to determine whether new drugs or treatments are both safe and effective. Carefully conducted clinical trials are the fastest and safest way to find treatments that work in people. TAU’s distance and online education program is one of the flexible ways for students to get educated being in their own town. Students can be benefited by this flexible Online Learning from Web Campus i.e., TAU Online Learning Management System. Chat Application – where you can chat with their peers and fellow students all over the world. 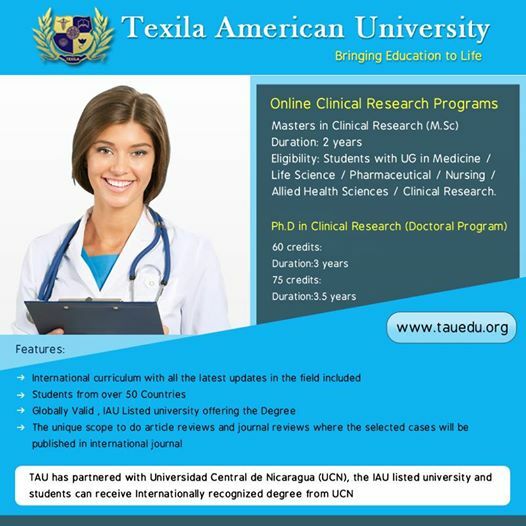 Texila American University has a continuing commitment to assist the registered nurses in attaining the baccalaureate degree. All RN students will have the opportunity to receive advanced placement credit upon completion of specific courses. This program is also called the RN- BSN Conversion program. This is for those nurses who are already registered nurses, but would like to further their knowledge and upgrade themselves with a Bachelor of Science in Nursing degree. Students will be provided training for CGFNS Exams. CGFNS protects the public by ensuring that nurses and other health care professionals educated in countries other than the United States are eligible and qualified to meet licensure, immigration and other practice requirements in the United States. 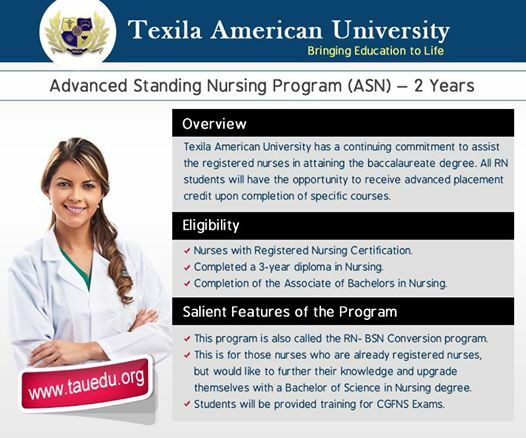 TAU provides training to students for NCLEX exams- this is in built with the Curriculum. NCLEX exams is conducted by the National Council of State Boards of Nursing [ NCSBN]. Nurses with Registered Nursing Certification. Completed a 3-year diploma in Nursing. Completion of the Associate of Bachelors in Nursing. Duration of the Program: 2 Years. The Chhattisgarh government is making desperate attempts to convince the Medical Council of India (MCI) to reverse its recent decision to 200 medical seats in the state for the ensuing 2014-15 academic years. With the cut, only 250 seats are left, leaving other aspirants in a lurch. 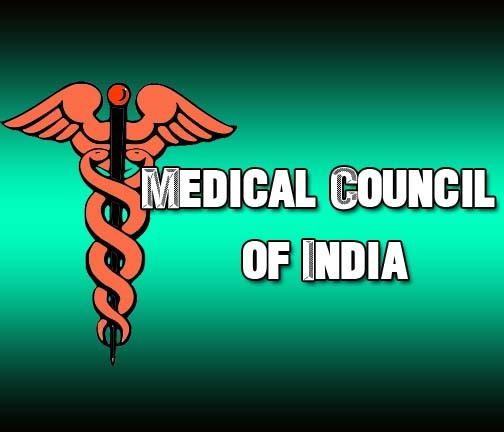 According to information, the MCI found a host of deficiencies in all the state-run medical colleges at Raipur, Bilaspur, Jagdalpur and Raigarh and it cut 50 seats in each of the institutions. While Raipur and Bilaspur Medical colleges hitherto had 150 seats each, the MCI has permitted to counselling for only 100 seats in each college. The Jagdalpur Medical College, which earlier had 100 seats, has been permitted to recruit for only 50 seats. The Raigarh Medical College, which only had 50 seats, has been declared a “zero year” with the all the seats being cut for various deficiencies, including faculty. 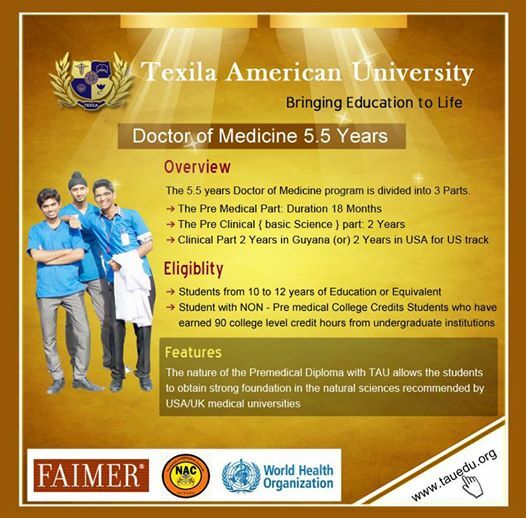 Texila American University has developed knowledge; competency and research based customized Master of Medical Science programs in various medical specialties to augment the dearth of specialty doctors in various medical fields. Similar programs are very much in vogue in countries like United Kingdom, Australia and Malaysia. Dual degree will be offered , by TAU & UCN. A unique program which helps to attain the Masters in a span of ONE year. Students with basic Medical Education is inducted into this program. 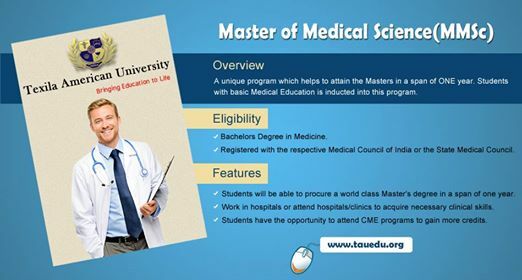 The 5.5 years Doctor of Medicine program is divided into 3 Parts. 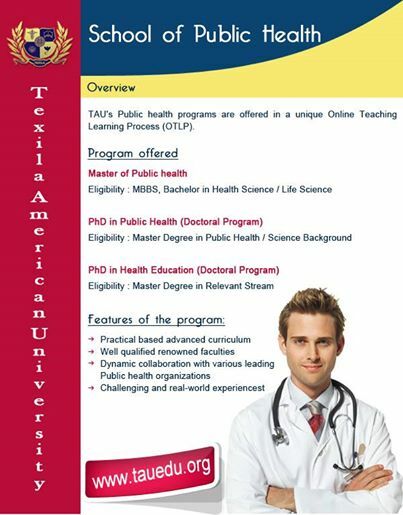 Texila American University offers a unique program which helps to attain the PG Diploma in a span of Eight Months. Students with basic Medical Education is inducted into this program. Student can pursue from his own place without re-locating as it is an External program. Study while you earn – Need not leave the present profession. Can acquire wider knowledge and exposure. 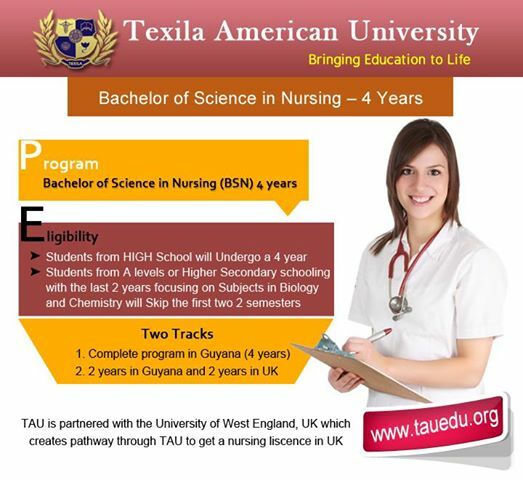 TAU’s 4 Years Bachelor degree of Nursing Provides student an opportunity to get in touch nursing profession practically as well as theoretically. The program is designed on the basis of requirement of professional at Developed and Developing economy. Our curriculum prepares graduates to perform basic nursing and restorative care for patients involving safety, personal hygiene, nutrition, mobility, basic mental health, protection of the patient and the patient’s rights, observing the patient and reporting to the nurse. 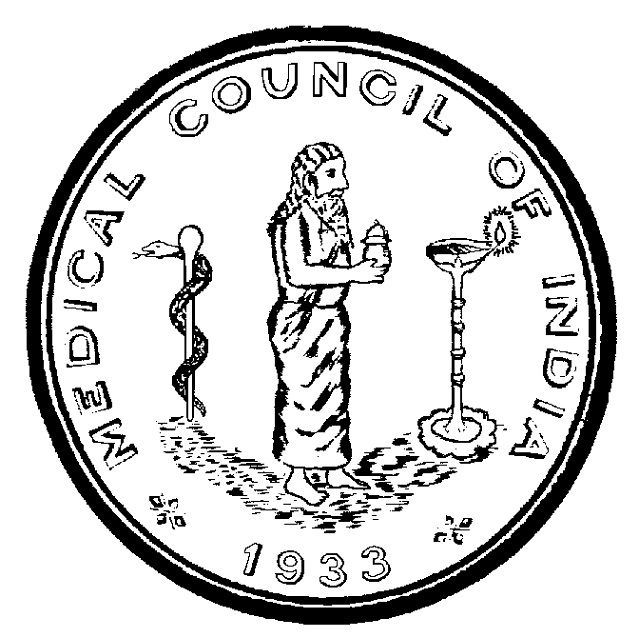 The Medical Council (MCI) of India has debarred a city doctor from practicing for three years after its ethics committee found him guilty of medical negligence and printing incorrect information about his qualification on the prescription paper. The order came on petition filed by banker Sudhir Srivastava who held that his wife Nidhi died due to wrong diagnosis and treatment by Dr Vipul Shah. A copy of the order, that was received by the applicant on Wednesday, debarred Dr Shah from practice for two and three years under separate charges. Both the suspension will run simultaneously. The MCI has directed state medical faculty to erase the name of Dr Vipul Shah from its record. On being contacted, Dr Vipul Shah said that he was not aware of any such order.